Looking to book Moody Blues for a corporate event, private party, fundraiser or public event worldwide? BookingEntertainment.com makes it easy and trouble free to check availability and pricing for booking Moody Blues or any other act in the business with absolutely no obligations. Booking Entertainment is the leading entertainment booking agency specializing in booking Moody Blues. We will be happy to help you get Moody Blues's booking fee, or the price and availability for any other band, comedian or celebrity you may want for your corporate event, birthday party, wedding, fundraiser or public show. At Booking Entertainment, we put our 23 years in business behind you to help you get the best price for any entertainer, comedian or celebrity for your event. In addition, our team of seasoned industry professionals can handle every aspect of the entertainment portion of your event to make sure the entertainment runs flawlessly. If you are wondering how to book Moody Blues for your event, you can trust our Moody Blues agent to handle it for you. Find out why Fortune 500 companies, high net worth individuals and fundraising organizations come back to Booking Entertainment year after year for their entertainment buying needs. We can literally book any act for you anywhere in the world. The Moody Blues came together in Birmingham, England in 1964 when founders Ray Thomas and Mike Pinder joined forces with Denny Laine, Graeme Edge, and Clint Warwick to create the band. Within only six months, the Moody Blues had earned a recording contract and they began releasing singles. Their first, “Steal Your Heart Away,” didn’t hit the charts, but “Go Now,” their follow up, hit number one on the charts in England and rose to number ten in America. The success of their single earned the Moody Blues a spot as an opening for the Beatles on tour, although a successful follow up to their smash hit would elude the Moody Blues and create lasting frustrating until 1965, when the band would create a whole new sound with their fourth single, “From the Bottom of My Heart.” The single only peaked in the twenties on the British charts, but it became an iconic achievement for the music period known as the British Invasion. In 1966, Warwick and Laine left the Moody Blues, and were replaced by John Lodge and Justin Hayward. The Moody Blues began to add more psychedelic sounds to their music, creating more textured tracks, as with the album Days of Future Passed, which featured the song “Nights in White Satin.” The single made it to the Top Ten in Britain, and its American follow-up “Tuesday Afternoon,” also made it to the top of the charts. The Moody Blues followed up this success with the release of In Search of the Lost Chord in 1968, which utilized the innovative sound of the Mellotron, an organ-like instrument which Pinder learned to master quickly. The Mellotron gave a unique, eerie, almost orchestra-like sound to the Moody Blues’ new album and set them apart from their contemporaries. In Search of the Lost Chord showcased the new sound on songs such as “Dr. Livingston I Presume,” “Visions of Paradise," "Om,” and “Legend of a Mind.” The Moody Blues’ follow up album, To Our Children’s Children’s Children (1969), went further in taking that sound and utilized studio techniques to layer their songs through overdubbing of instruments and vocals. The only challenge the Moody Blues encountered was that the band had now created an in-studio sound which was nearly impossible to recreate live with only five musicians. The Moody Blues wrote and recorded more carefully for Beginning with a Question of Balance (1970), crafting songs that could be recreated live in concert, and they continued that effort with Every Good Boy Deserves Favour, their next album. All five members of the Moody Blues contributed during the writing stage for these albums, and their music evolved to a nearly progressive rock which was accessible to the mainstream. Seventh Sojourn (1972) came next, but by then the Moody Blues were growing wearing of constant recording and touring, and they opted for a hiatus. Each member embarked on solo projects, but it would be five years before they would come back together again as the Moody Blues. The Moody Blues reunited in 1977 and released Octave in 1978. Long Distance Voyager followed in 1981, but by this time the band was facing competition with MTV-era musicians such as Madonna, and an ever-changing music sound. Although they had a few additional hits in the 1980’s, by the end of the decade they had faded into a nostalgia act. Nevertheless, the Moody Blues released a four-CD set, Time Traveler, in 1994, and then Strange Times, a new studio album, in 1999. In the new millennium, the Moody Blues has carried on as a trio, without Thomas and Pinder. Since the band’s inception, the Moody Blues has sold more than seventy million albums worldwide and earned fourteen gold or platinum records. They continue to perform live in the new millennium, having completed extensive tours every year from 2006 to 2010, and with plans for tours in the coming years. For more information on booking Moody Blues, please contact Booking Entertainment. One of our top booking agents will be happy to work on your behalf to get you the best possible price to book any big name entertainer for your upcoming public, private or corporate event worldwide. The agents at Booking Entertainment have helped clients book famous entertainers like Moody Blues for private parties, corporate events and public shows around the world for over 23 years. Our agents will be happy to assist you with any of your famous entertainment buying needs. All you need to do is fill out an entertainment request form or call our office at (212) 645-0555, and one of our agents will help you get pricing information and available dates for Moody Blues or any other A-list entertainer for your next event. How to book Moody Blues for a corporate event? Booking Moody Blues for corporate events is a great way to thank your employees and clients, and in addition, hiring Moody Blues for a corporate event is a fantastic way to promote your company's image to your industry. Booking Entertainment can book Moody Blues for corporate events worldwide, providing you with the fee to book Moody Blues and their availability on your specific date. 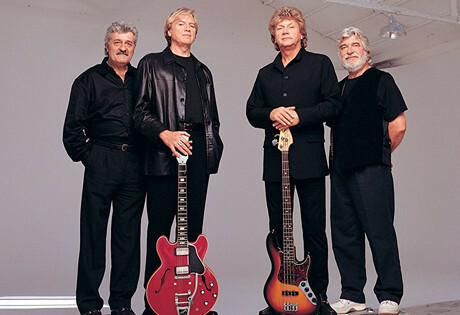 We have helped our clients book Moody Blues and thousands of other acts for almost 25 years. Whether you are looking at hiring Moody Blues for a corporate event, product launch, trade show, holiday party or an employee appreciation event, your assigned Booking Entertainment agent will be happy to get you the best price for booking Moody Blues and help make sure that every aspect of the entertainment portion of your corporate event is executed flawlessly. How much does it cost to book Moody Blues for a corporate event and what do the fees for booking Moody Blues include? If you are looking to hire Moody Blues for a corporate event and are looking for Moody Blues’s booking fee for corporate events, Booking Entertainment will be happy to get you pricing to book Moody Blues for your date for free. The cost of hiring Moody Blues for your corporate event can include just the price of booking Moody Blues for a corporate event, or we can give you an estimate for booking Moody Blues that includes absolutely everything that goes into hiring Moody Blues including all fees, flights, hotel, ground, production, green room requirements and our veteran production team onsite to make sure everything runs smoothly from load in to load out. How Much Does It Cost To Hire Moody Blues? Looking for Moody Blues booking cost, fee or pricing? When you are booking an act like Moody Blues, many factors determine the final price, including the artist's touring schedule and other shows they may have in your area. Fill out an entertainment request form or call our offices at (212) 645-0555 and one of our booking agents will get you a pricing fee and availability for your date and assist you in booking Moody Blues or a different well-known act for your next event. How Do I Hire Moody Blues For A Private Party? Wondering how much does it cost to book Moody Blues for a private concert or will Moody Blues play a private party? Whether you are looking to book Moody Blues for a wedding, private party or anniversary party, our Moody Blues booking agent who specializes in booking Moody Blues will be happy to help you to book Moody Blues and take care of everything necessary to make sure the show is executed flawlessly. Fill out an entertainment request form or call our office at (212) 645-0555 and one of our Moody Blues booking agents will assist you in hiring Moody Blues for a private event anywhere in the world. How do I hire Moody Blues for a college concert from booking agencies that book concerts for colleges and universities? Booking talent for college and university events is something Booking Entertainment has been helping college talent buyers do for almost 25 years. Whether you are looking to book Moody Blues for a sorority party / fraternity party or a college concert event sponsored by the college entertainment committee, college talent buying is something we specialize in at Booking Entertainment. Simply fill out our form, email us or call the office and one of our college booking agents will be happy to help you make sure that every aspect of booking Moody Blues or anyone else for you college event is taken care of to ensure your college or university concert runs smoothly and cost effectively. How much does is it cost to book Moody Blues for a college or university concert and are fees for booking college concerts less expensive? When college entertainment buyers book famous entertainers such as Moody Blues to play for college concerts, sorority parties or fraternity parties at colleges and universities, we know the acts tend to charge a lower fee than they would cost for a traditional public or private concert. Of course, how expensive it is to book college entertainment depending on how big of an act they are, but colleges and universities tend to get a better fee for booking big name entertainment for college and university events. One of our college entertainment booking agents will work closely with you to make sure you get the best possible price for your college’s concert. Buyers who don't have a lot of experience booking famous acts often find the process frustrating when they try to do it on their own. Our Moody Blues agent that specializes in booking Moody Blues can use our reputation and relationships to help you navigate the entertainment buying process and get your offer for booking Moody Blues seriously considered. The artist’s managers want to know that everything will be handled properly, and Booking Entertainment’s stellar 23-year reputation and our attention to detail provide them with the peace of mind that the show will be flawlessly executed from beginning to end. How Do I Book Moody Blues For A Fundraiser or Gala? Wondering how much does it cost to book Moody Blues for a fundraiser or will Moody Blues play a gala? Your assigned Moody Blues agent will be happy to help you to book Moody Blues and we can even take care of everything necessary to make sure booking Moody Blues is easy and trouble free. Fill out our entertainment request form or call our office at (212) 645-0555 and one of our booking agents for Moody Blues will assist you to book Moody Blues or any other entertainer or celebrity for your next fundraiser or gala anywhere around the world. How Do I Book Moody Blues To Perform At My Wedding? You might ask yourself, “How do I hire Moody Blues for a wedding?" We have helped hundreds of clients book acts like Moody Blues for weddings and wedding ceremonies worldwide. Your assigned Booking Entertainment agent will not only be happy to assist you in hiring Moody Blues to perform at your wedding, we will be onsite to make sure booking Moody Blues for your wedding is executed flawlessly. Can I book Moody Blues for a wedding and how much does it cost to book Moody Blues to sing at a wedding? If you are serious about booking Moody Blues for a wedding, Booking Entertainment will gladly get you the Moody Blues booking fee and availability for booking Moody Blues for your wedding date. The price for booking Moody Blues will include all of the fees and additional expenses necessary to hire Moody Blues for a wedding including all production costs, flights, hotels, ground and green room requirements. If I hire Moody Blues to perform at my wedding, how do I integrate booking Moody Blues into my wedding? Hiring celebrity entertainment for a wedding is a great way to surprise the guests or even the bride or groom. When we book big name acts like Moody Blues for weddings, we work closely with the wedding planner beforehand to make sure everything involved with the entertainment integrates seamlessly with the flow of the wedding . Our staff of veteran producers will then be onsite at the wedding to make sure when you book Moody Blues for your wedding, everything runs smoothy from load in to load out. How do I contact Moody Blues’s agent or Moody Blues’s manager? Even if you have Moody Blues contact information, Moody Blues’s management contact info like Moody Blues’s manger's email or even Moody Blues’s manager's phone number, you still need a company like Booking Entertainment to help coordinate everything that is necessary to book Moody Blues to perform for your event. Agents and managers contact us all the time to help people that find the agency contact info or management contact info and contact the agents and mangers directly. Managers and agents trust our agency to handle everything to the industry standard as we have for almost 25 years. How Do I Book A VIP Experience With Moody Blues At A Event Or Concert? With Booking Entertainment, booking premium seats and backstage meet & greets with Moody Blues is easy and accessible to anyone around the world. Fill out an form or call our office at (212) 645-0555 and one of our agents will assist you to get pricing and availability to have Moody Blues VIP experience at a concert or event. Booking Entertainment works to get the best possible Moody Blues booking fee and Moody Blues price for our clients while also providing the celebrity or famous entertainer with the level of professionalism and industry norms that they expect from an event run by a professional booking agency and production management. Booking Entertainment uses our agency / management relationships and over 23 years of production experience to help buyers of headline / top name entertainers and does not claim or represent itself as the exclusive Moody Blues agent, manager or management company for any of the artists on our site. Booking Entertainment does not claim or represent itself as the exclusive booking agency, business manager, publicist, speakers bureau or management for Moody Blues or any artists or celebrities on this website.